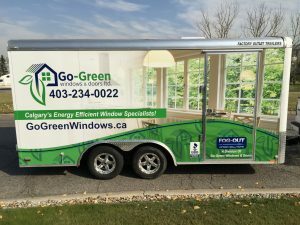 We are a local Calgary business with a mission to help homeowners decide how best to improve upon their windows and doors. Whenever possible we endeavor to repair a window versus replace it. By extending the life of a window we can save our customers money and our landfills from non-recyclable materials. When new windows are required, we install top quality products that are guaranteed to last 25 years. Rob Hornberger, owner/operator, grew up helping his father with window cleaning services throughout Calgary. This is where he learned the importance of providing high quality, professional services at fair prices. In 2004, he started his own company – Fog-Out Window Solutions. Seeing an opportunity to expand on window repair services and add windows and door installations, Rob started a second company, Go-Green Windows and Doors Ltd. Rob has kept the family tradition by including other family members in his operation, including his wife, 3 of his 6 children and other members of his extended family. Deal direct with a company with an owner who oversees and most often participates in all projects, accepting nothing less than quality work. Receive honest recommendations as to whether you need a less costly repair versus a new installation. Feel secure with a long-term warranty and no-risk money-back guarantee. Work with a company with a keen sense of green when it comes to conserving and giving back to our environment.